Dubai, UAE, February 25, 2019- Bentley Systems, Incorporated, the leading global provider of comprehensive software solutions for advancing the design, construction, and operations of infrastructure, presented SYNCHRO XR, its app for immersively visualizing 4D construction digital twins with the new Microsoft HoloLens 2, which Microsoft announced during a press conference at Mobile World Congress in Barcelona. Selected as a Microsoft mixed reality partner representing the architecture, engineering, and construction (AEC) industry, Bentley demonstrated how with SYNCHRO XR for HoloLens 2, users can interact collaboratively with digital construction models using intuitive gestures to plan, visualize, and experience construction sequencing. 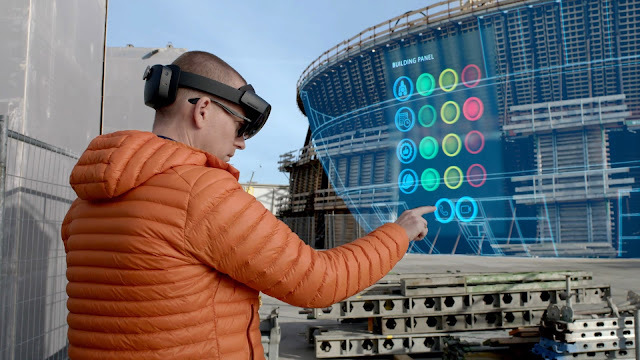 Project digital twin data is visualized with the HoloLens 2 via Bentley’s connected data environment, powered by Microsoft Azure. With the mixed reality solution, construction managers, project schedulers, owner operators, and other project stakeholders can gain insights through immersive visualization into planned work, construction progress, potential site risks, and safety requirements. Additionally, users can interact with the model together and collaboratively experience 4D objects in space and time, as opposed to traditional interaction with a 2D screen depicting 3D objects. Microsoft’s Mixed Reality Partner Program is focused on enabling and supporting solution providers who are committed to building mixed reality solutions. Upon acceptance to the program, Microsoft provides training, technical assistance, sales and marketing enablement, and business planning. In 2018, Microsoft awarded Bentley Systems as its CityNext Partner of the Year.